CNC Software, Inc. of Tolland, CT is owned by Mark Summers, a champion of sustainable business practices and a true steward of the natural environment. A 73kW solar array powers his offices, and as Chair of Tolland's Energy Task Force, he helped the Town retrofit its offices with a geothermal heat pump system. The system will save the town millions of dollars and will contribute to a cleaner, greener future for the community. 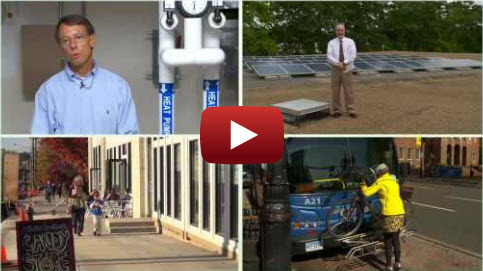 Learn more about Mr. Summers/Tolland's energy retrofit and view our Municipal Energy Champion video. The natural resources in the Capitol Region include beautiful and historic rivers and river valleys, clean air and water, extensive and diverse forests, unique landforms, and abundant wildlife. Consideration and protection of our environment and these critical resources while the region continues to develop will be crucial to preserving the character and high quality of life that prevails here. A broad array of related conservation, preservation and development strategies have been employed to help us meet the needs of today while ensuring these resources are available for future generations. Browse through the environment section of the Clearinghouse to find examples of policies, plans and programs that: encourage sustainable development, infill development and brownfield remediation efforts; work to address climate change, promote energy conservation and independence and the use of renewable resources; support open space and farmland preservation; protect our air, water and soil; mitigate the impacts of natural disasters on our communities and more. 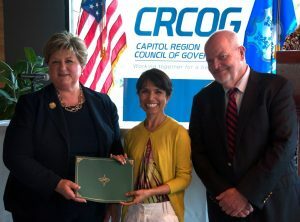 The Town of Mansfield received CRCOG’s 2016 Regional Sustainability Award in early June for Mansfield Tomorrow: Plan of Conservation and Development. This comprehensive POCD has created a unified vision for the Town and its Planning and Zoning Commission, and establishes a framework for promoting sustainability and the incorporation of best practices. An extensive stakeholder engagement process helped lay the foundation for the significant, measurable progress that has already occurred in the eight months since the Plan’s adoption. Highlights of implementation work include: forming a bicycle advocacy group that will spearhead the development of the recommended Bicycle and Pedestrian Master Plan; drafting a Complete Streets policy; working on affordable housing updates to the Town’s zoning regulations; launching a new economic development section of the Town’s website; and establishing a climate change committee. Produced as part of the Sustainable Knowledge Corridor project, each two-page brief focuses on an important issue (Housing, Transportation, Food Security, Environment, Land Use, Climate Action or Green Infrastructure) and its role towards creating more sustainable communities. The summary documents provide: an overview of the topic and why it is important; related issues and trends; how progress is measured; action steps to support change; and links to additional information. 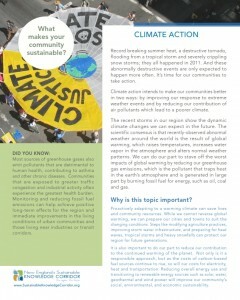 Click here to access the Climate Action brief. Click here to access the Environment brief. 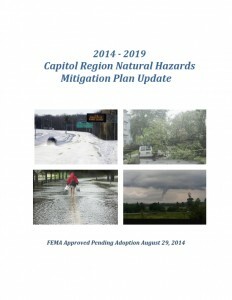 With funding provided by the Federal Emergency Management Agency (FEMA), CRCOG developed a Natural Hazard Mitigation Plan update for its thirty member municipalities. (The agency has since expanded its membership to include thirty-eight communities.) This plan builds on the existing Pre-Disaster Natural Hazard Mitigation Plan of 2008, and was intended to: identify natural hazards likely to affect the Capitol Region and its residents; assess vulnerabilities to these hazards; and set forth mitigation strategies that will reduce the loss of life and property, economic disruptions and the cost of post-disaster recovery for the region’s communities. 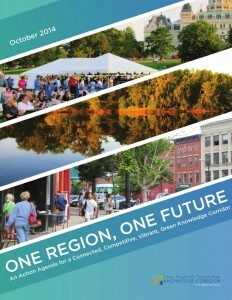 Visit the CRCOG website to download the full plan update, appendices and individual municipal sections. Produced by the American Farmland Trust and the Connecticut Conference of Municipalities, Planning for Agriculture is a “primer and introductory toolkit for planners and municipal officials” that will help inform efforts to preserve and protect local agriculture in Connecticut. 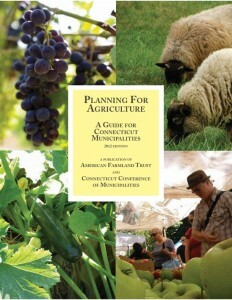 The guide defines the fiscal, economic, environmental and recreational benefits of agriculture; prompts towns to reflect on how well they are planning a future for agriculture in their communities (it includes a checklist for gauging how supportive of agriculture a town is); provides tools for getting started; and highlights a handful of case studies and key resources. As the culmination of a three-year HUD Sustainable Communities Regional Planning Grant, the Sustainable Knowledge Corridor Consortium generated its action agenda, One Region, One Future for the Sustainable Knowledge Corridor bi-state region. The recommended actions listed in the document are hoped to move the region toward a connected, competitive, vibrant and green future. The Agenda outlines not only the actions that need to be taken, but also which partners are best suited to take up the charge. 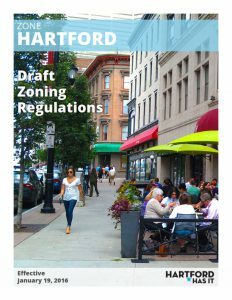 The City of Hartford received CRCOG’s 2016 Regional Sustainability Award in early June for Zone Hartford—a transformative, citywide form-based code that prioritizes environmental sustainability. The new zoning regulations take the City’s vision for sustainable development to the all-important implementation stage—offering a comprehensive blueprint for other communities to consider as well. The Code: prioritizes the reduction of the City’s carbon footprint and resilience; creates a typology of building and street types to compliment Hartford’s historic fabric; establishes overlay districts, including TOD and a Connecticut River District, which require high density development; and incorporates New Urbanist design principles. It incentivizes renewable energy use; explicitly authorizes urban agriculture; embraces Completes Streets; encourages maker spaces; and so much more. Click here to access the adopted zoning regulations. EPA has released a new online training module to help local government officials take actions to increase their communities’ resilience to a changing climate. The training explains how a changing climate may affect a variety of environmental and public health services, such as providing safe drinking water and managing the effects of drought, fires and floods. It describes how different communities are already adapting to climate-related challenges and provides examples of effective strategies that have been implemented in cities and towns across the country. The module also provides links to a number of resources that can help local government officials get started with adaptation planning in their own communities. Click here to access the training on-line. 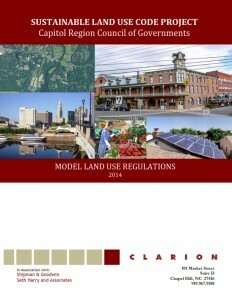 CRCOG’s innovative booklet of Sustainable Land Use Model Regulations equips towns with model regulatory language covering ten specific topic areas, including Energy Conservation and Alternative Energy (with a focus on solar, geothermal and small wind energy, solar access protection, energy-efficient lighting and green roofs). The project, funded by a HUD Sustainable Communities Regional Planning Grant, also included the creation of renderings to help communities visualize the physical impact of implementing the regulations. The visualizations were created for urban, suburban and rural communities at both a bird’s eye and street-level view. Click here to access: specific regulations by topic, the complete compendium of regulations, the accompanying visualizations and a video about the project. 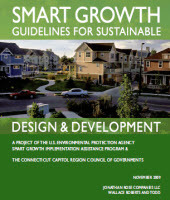 In 2008, the Capitol Region Council of Governments (CRCOG) collaborated with the Environmental Protection Agency (EPA) to establish guidelines for sustainable design and development specific to the Capitol Region’s unique blend of urban, suburban and rural municipalities. Included are guidelines for incorporating high performance buildings and green energy production and supply into community design. Download the full printable version (.pdf) to read more. 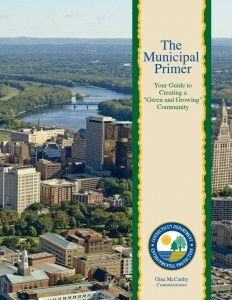 Produced by the Connecticut Department of Environmental Protection (now the Department of Energy and Environmental Protection) as part of a municipal outreach effort, the Municipal Primer provides basic information and guidance on a wide variety of topics related to environmental protection. Its purpose is to inform municipal decision-makers about environmental issues, the potential impacts of their decisions, environmentally preferred alternatives, and potential permit or license requirements. The intent is to give municipal officials a tool that allows them to quickly determine which CT DEP (now DEEP) programs relate to any given situation, and provide additional information sources including Web page links and staff contacts. The document includes two main themes: 1) landscape stewardship, or how we cooperatively manage and regulate land and its uses in an environmentally responsible way; and 2) environmental permitting and compliance requirements. Click here to download the Primer. New England’s Knowledge Corridor Partnership — formerly the Hartford-Springfield Economic Partnership — was founded in September 2000 with the support of the governors of Connecticut and Massachusetts. NEKC is an interstate collaborative of 28 regional economic development, planning, business, tourism and educational institutions with a shared interest in advancing the region’s economic progress. The area transcends political boundaries, comprising New Haven, Hartford, Middlesex and Tolland counties in Connecticut and Hampshire, Hampden and Franklin counties in Massachusetts. The region is linked by a shared industrial history, economy and workforce, as well as key features such as Bradley International Airport, rail lines, Interstate 91 and the Connecticut River. The NEKC Partnership markets the region as “New England’s Knowledge Corridor,” emphasizing the area’s rich history of innovation, invention and world-class educational assets. For more information, visit www.KnowledgeCorridor.org. Wheels For Wishes & Wellness is a 501(c)(3) nonprofit vehicle donation program benefiting children’s hospitals in Connecticut. The car donation program offers a simple alternative to selling or trading in an unwanted vehicle and provides donors with free towing and a tax deduction. Cars are either auctioned for new owners to reuse, or they’re recycled into materials that can be used to make other vehicles. Learn more at connecticut.wheelsforwishes.org. Patagonia donates 1% of its sales to support environmental organizations around the world at the grassroots level in countries and communities where they have people on the ground. Grants, typically up to $12,000, are awarded to organizations working on action-oriented environmental projects that build public involvement and support and have measurable goals, objectives and action plans. Proposals are accepted on a rolling basis at local stores and semi-annually (April 30 and August 31) at the company’s headquarters. For more information, visit Patagonia’s website, or go directly to the grant guidelines. The Center for a New American Dream is now accepting applications (through May 31, 2015) for its 2015 Get2gether Neighborhood Challenge Grant. New Dream will help teams raise funds for a project to improve their neighborhoods and will match funds raised by each selected team up to $2,000. The proposed project must be focused on building a local economy, greening your community, or be linked to a sharing system. It should be replicable in other areas around the country and must be completed before March 31, 2016. Click here to learn more about the program, past project winners and to link to the online application. The City of Hartford received its second Regional Sustainability Award—this time for the City’s comprehensive efforts to leverage environmental sustainability to dramatically improve community resilience while improving the local economy, public health and social equity. Notable achievements, guided by the Mayor’s Climate Stewardship Initiative (CSI), include: the creation of a fully grant-funded Office of Sustainability; the creation and adoption of a Climate Action Plan that is steeped in local and national best practices; and the establishment of an Energy Improvement District Board that issued the first comprehensive plan of its kind in the state. CSI and the Office of Sustainability have implemented a series of resiliency and sustainability initiatives, including redistributing 4,295 excess meals throughout Hartford, facilitating a $5 million-dollar LED streetlight retrofit, and implementing Virtual Net Metering and Renewable Energy Credit contracts. CSI, in implementing many of these planning and developmental goals and initiatives, has created a broad and dynamic group of stakeholders from communities throughout Hartford; a model which could be replicated throughout the region. 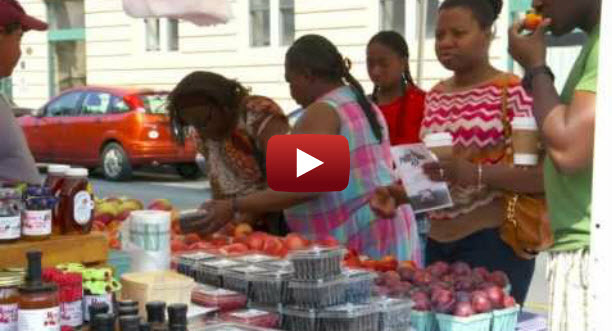 Click here to access the Hartford Climate Stewardship Initiative’s website. 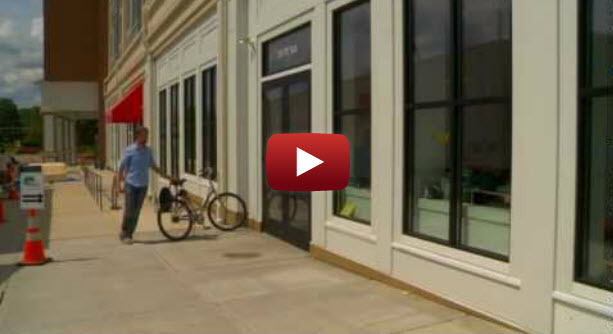 Click here to access a copy of Hartford’s Energy Improvement District Comprehensive Plan. 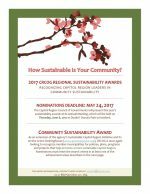 The Town of Stafford received CRCOG’s 2017 Regional Sustainability Award for its energy project work, its strategic and extensive leveraging of solar and geothermal technologies and its long-range vision for a greener future. The Town’s Energy Advisory Committee was instrumental in guiding the community’s efforts to achieve record-setting energy independence, significantly reduce its carbon footprint, save tax dollars and promote operating efficiencies for the town and the board of education. Stafford is expected to save more than $24 million over 25 years as it completes the execution of its long-term energy plan and reaches its net-zero goal. Click here for more information on Stafford’s Energy Advisory Committee and related projects. The Town of Coventry was presented with CRCOG’s 2016 Regional Sustainability Award for the progressive work of the Coventry Lake Advisory and Monitoring Committee (aka CLAM). 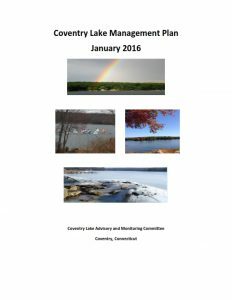 CLAM is an advocate for Coventry’s Lake Wangumbaug and its watershed, collecting, analyzing and sharing information to advise the Town of Coventry on best practices for preserving the lake and refining its value as a centerpiece of the community. The Committee has contributed significantly to the improvement of environmental quality through the protection, conservation and stewardship of this important natural resource, and has executed many innovative initiatives, including the recent completion of The Coventry Lake Management Plan and the annual ‘State of Coventry Lake’ public forums. Click here to access a copy of the Plan. The Town of Rocky Hill received CRCOG’s 2016 Regional Sustainability Award for the Town’s partnership with SolarCity for a Ground-Mounted Solar Photovoltaic Generation System. The 3.9 MW solar energy farm will consist of approximately 13,000 ground mounted solar panels. 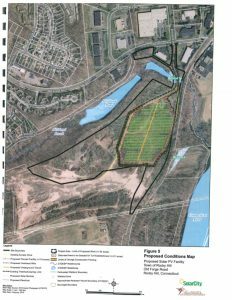 This green redevelopment effort will turn a vacant parcel of land with highly restrictive development potential into a municipal asset—one that will reduce municipal energy consumption and related costs significantly and will produce over 90,000,000 kWk of clean, renewable energy over its renewable 20 year contract period. In addition to using the most recent cutting-edge solar technology, Virtual Net Metering and the Zero Emissions Renewable Energy Credit program, the project showcased the importance of initiative, perseverance and collaboration to successfully overcome an extensive array of obstacles and challenges. 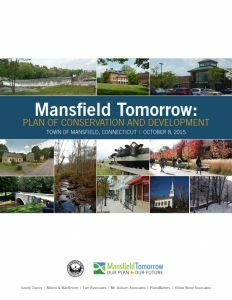 The Town of Mansfield received CRCOG’s 2016 Regional Sustainability Award for Mansfield Tomorrow: Plan of Conservation and Development. This comprehensive POCD has created a unified vision for the Town and its Planning and Zoning Commission, and establishes a framework for promoting sustainability and the incorporation of best practices. An extensive stakeholder engagement process helped lay the foundation for the significant, measurable progress that has already occurred in the eight months since the Plan’s adoption. Highlights of implementation work include: forming a bicycle advocacy group that will spearhead the development of the recommended Bicycle and Pedestrian Master Plan; drafting a Complete Streets policy; working on affordable housing updates to the Town’s zoning regulations; launching a new economic development section of the Town’s website; and establishing a climate change committee. Click here to access the Plan. The City of Hartford also received CRCOG’s 2016 Regional Sustainability Award for Zone Hartford—a transformative, citywide form-based code that prioritizes environmental sustainability. The new zoning regulations take the City’s vision for sustainable development to the all-important implementation stage—offering a comprehensive blueprint for other communities to consider as well. The Code: prioritizes the reduction of the City’s carbon footprint and resilience; creates a typology of building and street types to compliment Hartford’s historic fabric; establishes overlay districts, including TOD and a Connecticut River District, which require high density development; and incorporates New Urbanist design principles. It incentivizes renewable energy use; explicitly authorizes urban agriculture; embraces Completes Streets; encourages maker spaces; and so much more. Click here to access the Code. With a master contract in place between the Central Connecticut Solid Waste Authority (CCSWA) and Bay State Textiles, nine CCSWA communities (Bloomfield, Bolton, Canton, Cromwell, East Granby, Enfield, Glastonbury, Manchester and Simsbury) have signed on to participate in a textile collection program. Acceptable items for recycling include: footwear (shoes, boots, sneakers, flip flops); clothing (tops, pants, undergarments, pajamas, coats); accessories (hats, gloves, scarves, pocketbooks, tote bags, belts, ties); linens (sheets, blankets, comforters, dish towels, table linens, throw rugs, draperies, placemats); and stuffed animals. 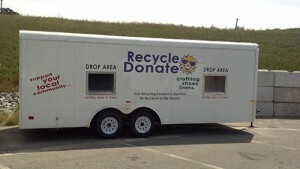 Collection boxes and trailers are typically located at transfer stations and bulky waste facilities, but can also be set up at schools, fire stations and other municipal locations. Participating towns are paid $100 per ton of textiles recycled, and will enjoy the added benefits of saving on disposal tipping fees and reducing their environmental impact by recovering more textiles (up to 95% can be reused or repurposed). Additional information, including copies of resulting contracts, can be found on the Capitol Region Council of Governments’ website. Visit Bay State’s website for news stories and examples of other successful recycling programs in Massachusetts. The Materials Innovation and Recycling Authority (MIRA) and Fuss & O’Neill have won a SWANA Bronze Excellence Award in the category of Landfill Redevelopment. The Solid Waste Association of North America (SWANA) awarded the Bronze Excellence Award to MIRA and Fuss & O’Neill for their entry: “Hartford Landfill State-of-the-Art Closure and Solar Electricity Generating Facility.” The award will be presented at SWANA’s annual conference, WASTECON, ® on Tuesday, August 25, 2015, in Orlando, Florida. In 2014, MIRA and Fuss & O’Neill completed a 35-acre state-of-the-art synthetic turf cap and one megawatt Solar Electricity Generating Facility (Solar EGF) atop the Hartford Landfill. “It is the first project in New England to marry a synthetic turf landfill cap and a solar energy facility,” said David Bodendorf, senior environmental engineer for MIRA. 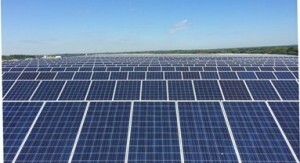 The final phase of the project included a 3,993-panel solar energy facility that can generate enough electricity to power about 1,000 homes when operating at full capacity. MIRA and Fuss & O’Neill’s winning entry can be found on SWANA’s website at https://swana.org/Awards/ExcellenceAwards/2015Winners.aspx.